The coyote from Nahuatl is a canine native to North America. It is smaller than its close relative, the gray wolf, and slightly smaller than the closely related eastern wolf and red wolf. It fills much of the same ecological niche as the golden jackal does in Eurasia, though it is larger and more predatory, and is sometimes called the American jackal by zoologists. The color and texture of the coyote's fur varies somewhat geographically. The hair's predominant color is light gray and red or fulvous, interspersed around the body with black and white. 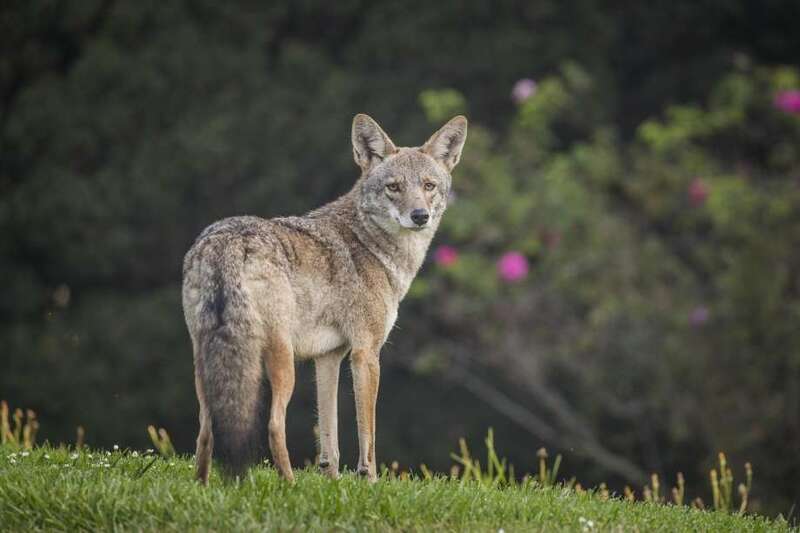 Coyotes living at high elevations tend to have more black and gray shades than their desert-dwelling counterparts, which are more fulvous or whitish-gray. The coyote's fur consists of short, soft underfur and long, coarse guard hairs. The fur of northern subspecies is longer and denser than in southern forms, with the fur of some Mexican and Central American forms being almost hispid (bristly). Generally, adult coyotes (including coywolf hybrids) have a sable coat color, dark neonatal coat color, bushy tail with an active supracaudal gland, and a white facial mask. Albinism is extremely rare in coyotes; out of a total of 750,000 coyotes harvested by federal and cooperative hunters between March 22, 1938, and June 30, 1945, only two were albinos.